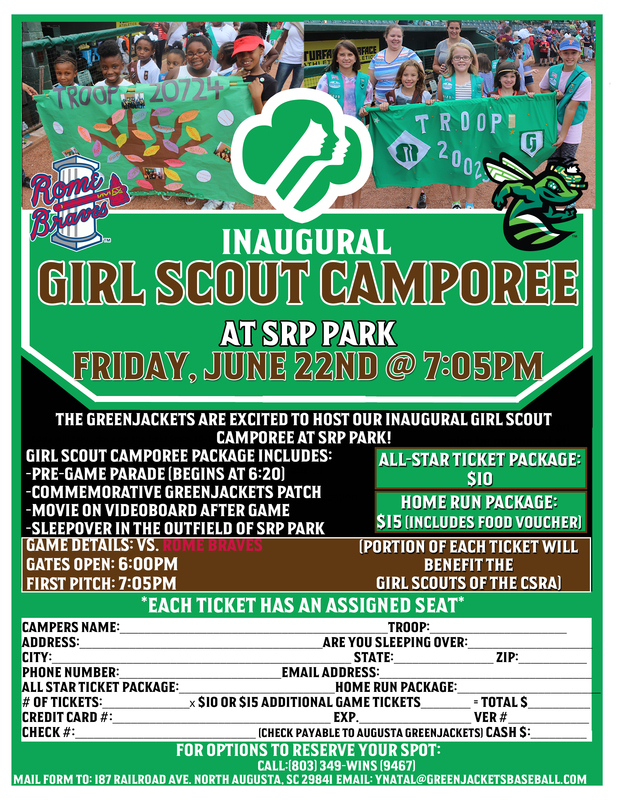 The GreenJackets invite the Girl Scouts of the CSRA to join us for a night of FUN at SRP Park in 2018 for our Inaugural Girl Scout Camporee. The Camporee is a staple in minor league baseball and the GreenJackets are excited to have you join us for a fun night! Girl Scout Camporee is Friday, June 22nd. We invite you to take in a GreenJackets game with your troop, join the pre-game scout parade, get a collectors GreenJackets Scout Patch, enjoy a movie from the video board and best of all, camp out on the field after the game! Plus, this year proceeds from the Camporee package benefits the Girl Scouts of the CSRA!